(f) if not, the reasons therefor along with the reasons for lowest hike in Pay Commission since last 70 years? 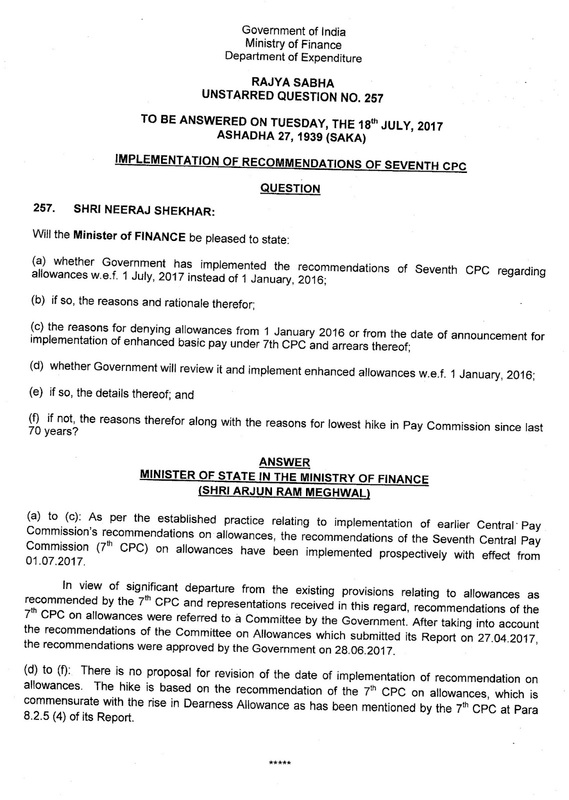 (a) to (c): As per the established practice relating to implementation of earlier Central Pay Commission’s recommendations on allowances, the recommendations of the Seventh Central Pay Commission (7th CPC) on allowances have been implemented prospectively with effect from 01.07.2017. 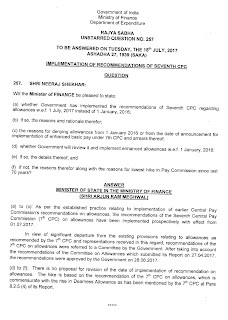 In view of significant departure from the existing provisions relating to allowances as recommended by the 7th CPC and representations received in this regard, recommendations of the 7th CPC on allowances were referred to a Committee by the Government. After taking into account the recommendations of the Committee on Allowances which submitted its Report on 27.04.2017, the recommendations were approved by the Government on 28.06.2017. (d) to (f): There is no proposal for revision of the date of implementation of recommendation on allowances. The hike is based on the recommendation of the 7th CPC on allowances, which is commensurate with the rise in Dearness Allowance as has been mentioned by the 7th CPC at Para 8.2.5 (4) of its Report. Government has saved its face since there is no recommendation from the committee fro revision of the date of effect. Since the committee has been formed by the government it is quite easy for them to play safe and not to recommend any modifications other than what is mentioned in the pay commission. But ultimately the government employees are granted only a meagre hike after waiting for a pay revision for 10 years. The pay revision report itself was just a gimmick. The CPC has just clubbed the total da granted till the date of effect of the implementation and no substantial benefits or pay hike have been granted to any central government employees through this pay revision. The grant of revised allowance is only a continuation of the same story. whether Government has implemented the recommendations of Seventh CPC regarding allowances w.e.f. 1st July, 2017 instead of 1st January, 2016; the reasons therefor along with the reasons for lowest hike in Pay Commission since last 70 years?